Alright, before I start, I would like to point out that I have gone back to reread one of my all-time favorite books. Prisoner in the Horned Helmet is not just a superb novel, but it is also a cool project. World famous fantasy artist, Frank Frazetta, teamed up with James Silke to bring one of his most impressive paintings to life in a four book series, often called the Death Dealer series after the title of the painting, which inspired the concept. I love the idea of art inspiring art. I have often based a story on a painting or a character in a role playing game on a new lead figure I had purchased. But this novel is not a lark or people trying to move into an area they are not ready for. This is a finely crafted novel on multiple levels. The story is strong and riveting. The characters are well crafted and intense. The villains match the heroes in intensity or perhaps surpass them. They in fact have a thing for villains and make them all seem horrid, dangerous, and unique. The writing is also tight and inspired. "He wore his sweat like an extra layer of armor�the night was as dark as a buried stick." Simple, but nice. The story itself follows Gath of Baal. Gath is a character who might give Conan second thoughts about taking on. An iconoclast, Gath lives out in the forest on his own. This changes when he is tricked into wearing the Horner Helmet. The artifact is a mixed blessing. With it on, the individual is all but immortal, but he still feels all pain and risks being controlled by the evil demi-goddess, the Black Vesta, who becomes his primary enemy. Gath finds a girl, who will become more important later, but he does not allow them to join due to his cursed nature. He is also aided by a leader of a troop of traveling actors named, Brown John. The authors craft a world of intensity. Every scene is well thought out and driving. Even little things like describing the spear Gath might be using lets you feel like you are holding it in your hands. The action is swift and crazed. Over the top, but this is a high level game. No wissy washy YA I need to tell my parents how I think or I hope she likes me crap, this is the giants fighting and either destroying or saving the world. Downsides... honestly, I cannot think of any with this one. 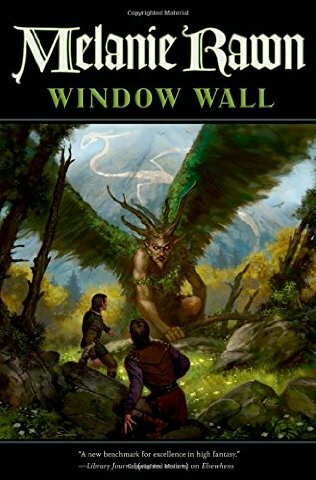 If you like fantasy this is simply a must read. If you never heard of it, now you have. If you enjoy Conan and Elric, you will love this novel. Gath has a little of both those heroes within him. A must read.